Celastrus orbiculatus old vine. commons.wikimedia.org (Accessed 7/2015). Celastrus orbiculatus is a large, woody twining, vine, stems to 12 m long; clonal by extensive root sprouts; bark gray, lenticels prominent; leaf scars and axillary buds raised, bud scales sharply pointed, feeling nearly thorn-like (Harlow 1959). Celastrus orbiculatus seedling. Appalachian Ohio Weed Control Partners. 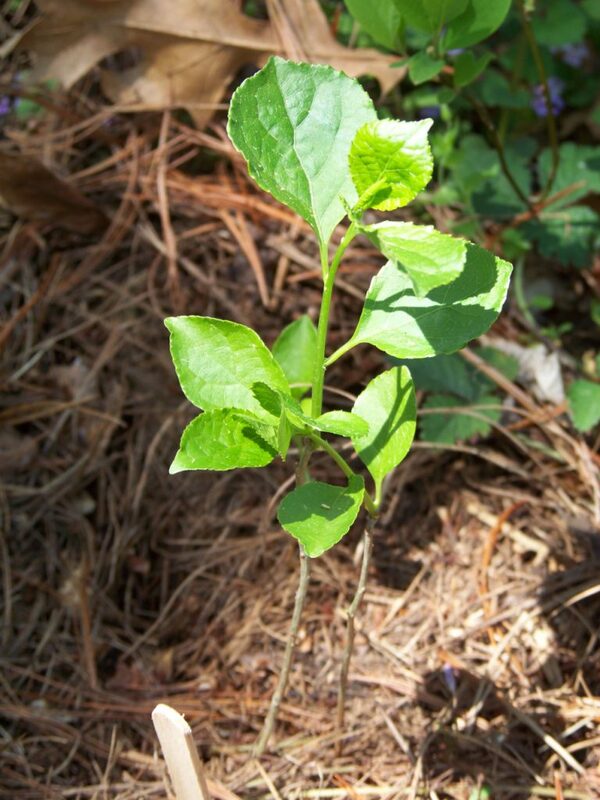 appalachianohioweeds.wordpress.com (Accessed 12/2017). Leaves alternate, 4-7 cm long, 3.5-5.5 cm wide, nearly round or widest above middle, tip pointed, margin with sharp or rounded teeth. Celastrus orbiculatus. Pistillate flowers. David G. Smith. Delaware Wildflowers. delawarewildflowers.org (Accessed 12/2017). Celastrus orbiculatus. Staminate flowers. David G. Smith. Delaware Wildflowers. delawarewildflowers.org (Accessed 12/2017). 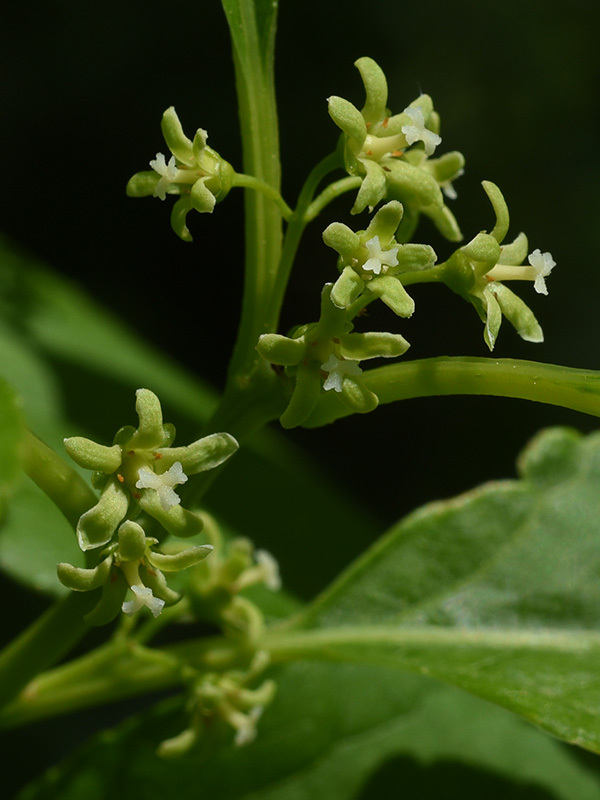 Flowers greenish white, radially symmetrical, 5-parted, functionally monoecious (polygamodioecious), (Radford et al. 1968); inflorescences of 1-3 in axillary clusters at nodes all along branches, these often appearing as dense clusters along short branches. Celastrus orbiculatus fruit.commons.wikipedia.org (Accessed 12/2014). Fruit a yellow capsule, opening in three parts to show scarlet aril covering several seeds; ripens in Oct., persistent through winter, pulp lipid <10%; seeds dispersed by birds including mocking birds, blue jays and European starlings (White and Stiles 1992; Swearingen 2007). Seeds germinate in spring at a high rate, but do not survive more than a year in soil (Van Clef and Stiles 2001). Habitat: Disturbed soil in open woods, along woodland edges, salt marshes, back dune scrub, roadsides. Shade tolerant, able to germinate and persist in low light (Robertson et al 1994). Soil pH 5-7.5, found in forest soil pH 5.6 (Gargiullo unpublished data), tolerant of fire, shade; moderately tolerant of drought; intolerant of salt, anaerobic soils although it is sometimes found in low sites that may be occasionally flooded (Gargiullo personal observation). Celastrus orbiculatus. covering other vegetation. commons.wikimedia.org (Accessed 12/2017). Notes: Covers shrubs and small trees at forest edges and in woodlands cutting off light supplies. 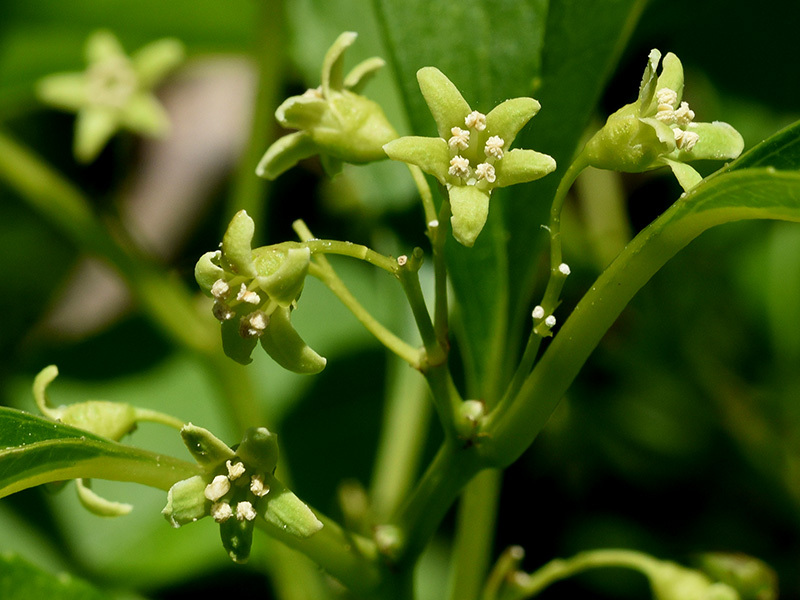 The vine also strangles woody host stems as it twines around trunks of shrubs or saplings and cuts off downward flow of phloem, which carries nutrients to non-photosynthetic plant parts. 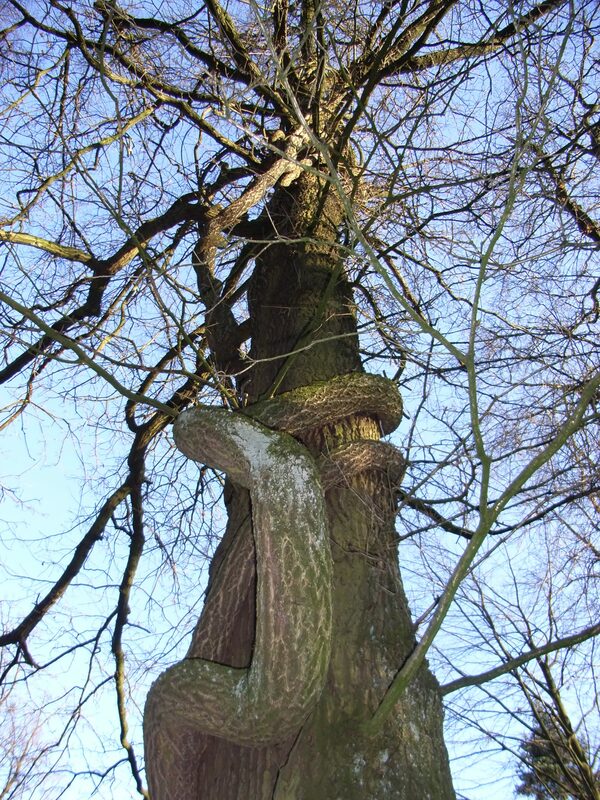 It distorts growth of saplings as the woody tissue realigns itself with the spiral track of the vine stem or sometimes the vine kills its host sapling outright (Lutz 1943). Bittersweet vines also increases crown damage from wind and ice due to added weight and surface area. Compared to C. scandens (American bittersweet), C. orbiculatus has greater pollen and seed viability, and produces more fruit (Dreyer et al. 1987; Young 1996). 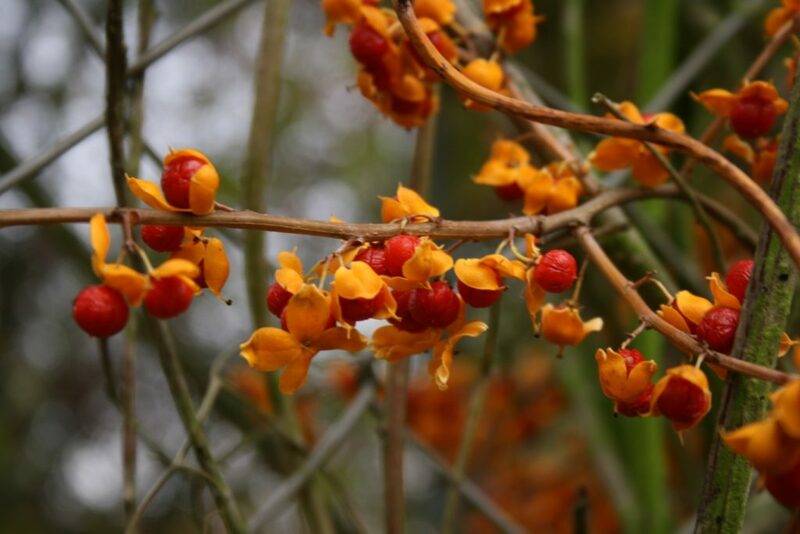 It has apparently outcompeted American bittersweet, which is becoming very scarce. American bittersweet has flowers and fruit in unbranched clusters only at the tips of the stems, Oriental bittersweet has fruit in branched or small unbranched clusters of 1-3 fruit along the length of stems. 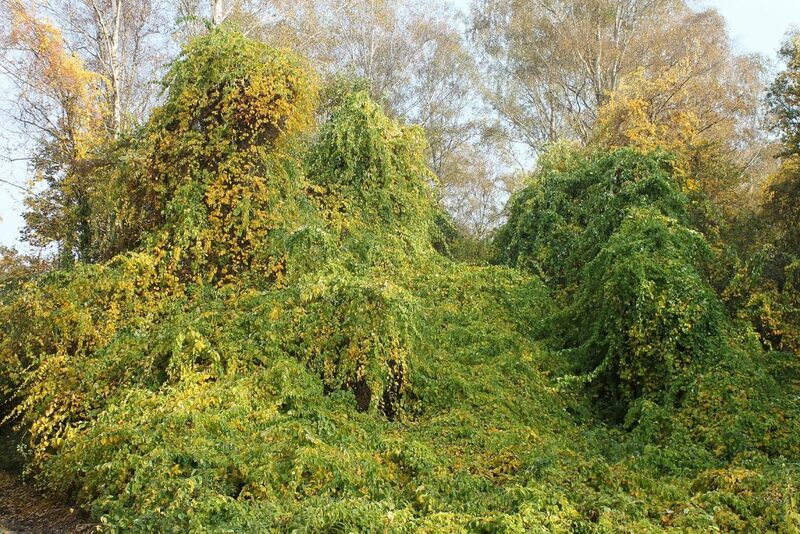 Listed as invasive by the Alien Plant Working Group and by several states (Swearingen 2007; USDA, NRCS 2006). Attacked by euonymus scale, Unaspis euonymi. Initial symptoms are yellow or whitish speckles on leaves cased by females along stems and leaf veins, a large infestation, in which the plant is entirely covered by whitish males, can defoliate a plant. However, this rarely happens to oriental bittersweet (Johnson and Lyon 1991).